I read (and wrote a lot about) Tim Keller’s book Walking with God Through Pain in Suffering in the last several months of our first infertility journey. One thing among many that always stuck with me was his noting from the Psalms when the psalmist talks to himself. “Why are you downcast, O my soul?” He says in Psalm 42. Keller writes a lot about the value of this “self-talk” — it’s a skill in counseling yourself out of a real or impending emotional pit. As a Christian you already have a strong foundation of things to self-talk about. You know the truth, even if you slip away from it in despair. This song calls that idea to mind. “Stay steadfast, my soul!,” cries the singer. And as a voice of experience (who is also fighting the pit with you), I call out with her from the next verse: “He’s in the waiting!” Be strong in this struggle, friend. If you’re wondering where God is in all of this, you have found Him. This is exactly where He is — in this struggle, in this mess, in this pain. He’s right here — in the waiting. I have been learning that our spiritual maturity is more likely to come from times of difficulty (momentary things like disagreements with coworkers, as well as big things like grieving a death) than times of ease. I’ve come to see there is a biblical truth to thinking that times of peace and “all is well” are more to be seen as the exception, and times of trial and suffering and needing to believe “all is well” are to be expected as the norm for the Christian life. I need a healthy mind and heart that is ready and expecting bumps in the road and not dreading and cursing them. They are welcomed catalysts for my growth. I need them. My faith is weak without them. I’ve been sharing quotes from Elisabeth Elliot’s book Keep a Quiet Heart. Please share your thoughts! Throwback Thursday: What Will be Said of You? I stopped there and started thinking about myself. 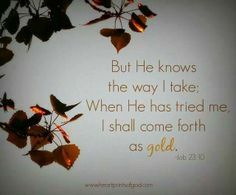 I had been walking a blessed road, in my assessment, and was struggling with why God would bring us, His faithful servants, into such an awful path of trial. I asked myself, What if this is the same situation as Job? What if God is betting with Satan that your faith is not based on your blessing? How are you doing? And if the story stopped tomorrow, what would be the conclusive line about how you handled it all? If I were honest, I would’ve said that I would’ve been ashamed at what would be said of me. I was struggling with the Lord and having trouble witnessing to others, praying at all, keeping hope, and trusting my beliefs, because I had crossed the 12-month line of trying to conceive and was realizing God was allowing us to enter this trial. I was bitter with Him, borderline (over the line?) sinful in my heart. I knew my fate was in His hands, and I was bothered at how He was handling it. So Satan was winning, you guys. If I was being bet on (by the way, what a compliment to Job that God had such confidence in his faith, right? ), I was losing. So I devoted myself to change my story. If it ends tomorrow, I don’t want my testimony to be, “In all this she crawled into a ball in her bed and cried for days until it was over.” Or “In all this she stopped praying and wouldn’t open her Bible, because she was giving God the silent treatment.” Or “In all this she whined and complained daily and made everyone else miserable.” Or whatever you would say is your current response. I guess this is just my challenge to you, from my own thoughts and mistakes, to search your heart and consider what would be written of you if you got your own book of the Bible like Job did. I hope your answer is better than mine was, and if not, I hope you have the wisdom to change it! 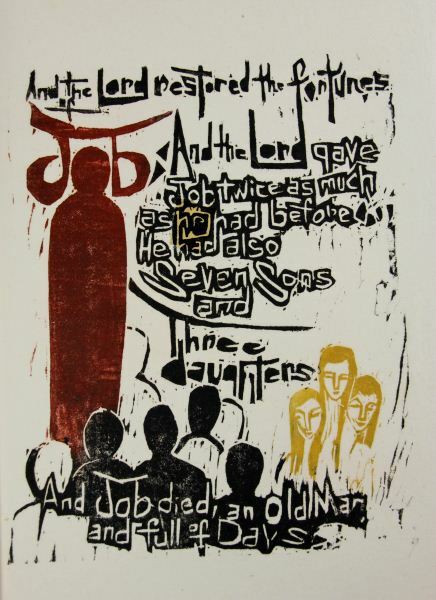 Click the image to read the book of Job. Reposted from September 19, 2013. Do you have this confidence in the Lord these days? …I love those verses! What confidence we have — we may not see Him or get what He’s doing, but we can be sure that He sees us, and will use this for our good. And is your testimony like this, in your darkest moments? Earlier is this chapter, Job was imagining how it would be to go face-to-face with God and plead his case. Haven’t we all been there? But by the end of these verses, he is brought back to the reality of who God is and who Job is. Have you lost sight of your place and God’s place? That’s a lot to think about, from just a handful of verses! I’ll leave you those to contemplate today. Please comment with any thoughts. I just stumbled upon this four-part sermon series by Pastor John Piper. I think I’m going to start working my way through it in the coming weeks, and I thought some of you may want to as well. If you listen, please come back and share any thoughts or words that were meaningful to you in the comments section! A perfect song about the sweetness of sorrow. As you seek to grow in Christ, I want to share with you this YouTube playlist from Desiring God. It is Ask John Piper, and includes hundreds of short (usually 1-3 minutes) biblical answers from Piper to a wide variety of questions about the Bible, theology, Christian life, and current events and issues. I highly recommend surfing through it! In the last several days I’ve encountered all sorts of encouragement on the web. I feel like I keep posting the same pastors and writers over and over, but it’s because I really respect them, and they’re biblical, and maybe a little because I live overseas and don’t have easy access to new people. But definitely more the first two. Lately, I’ve been trying to cultivate the habit of replacing thoughts-of-the-flesh with thoughts-of-the-Spirit (ahem, I’ve also been reading Galatians, if you can’t tell). This means, as a chronic worrier, when the “what ifs” move in and the anxiety starts to mount, instead of letting it build, I try to immediately put something else in my mind (“Whatever is true … think on these things”). For years my first line of combat has been prayer (“God, please stop these thoughts/calm my heart/make me sleep”); then reading or reciting scripture (“At times I am afraid, I trust in You)”. I’ve had to build up my arsenal in these really tough times, though, and one way I’m doing that is to always be reading at least one book of encouragement (though I may be reading a book for fun on the side, because sometimes reading books about suffering, etc. can bring me down, if I’m not in the right place for them). Anyway, it’s really been working, guys. I’ll be lying in bed, starting to worry, and will just get up and read my book until I’ve replaced the thoughts with truth. Anyway, let me share with you some places I’ve found encouragement lately, and you can take your pick. 1.) 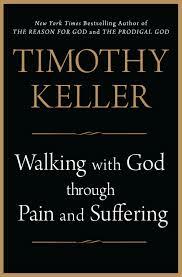 Yup, you guessed it, I’m going to say it again… Tim Keller’s Walking with God though Pain and Suffering (specifically parts 2 +3). I actually just finished it tonight, and I practically highlighted the whole book. I’m glad I did, too, because now I can go back and reread some highlights when I need encouragement again (which will probably be in the next 10 minutes… or 30 seconds). 2.) 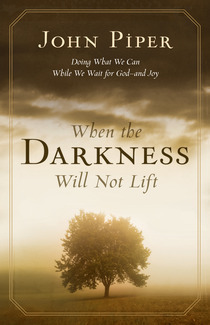 Tonight I found John Piper’s small book (under 100 pages) When the Darkness will not Lift for free (pdf) on the Desiring God website. It sounds like the perfect thing for right now, and I’ll probably finish it in one sitting. It’s about how to have joy while waiting for the Lord. Perfect, right? 4.) This short interview with Heather Platt was used by God to speak to one of my biggest fears right now — how to rejoice (and not wilt) when my close friend, who is pregnant, gets back to town in a couple months. Sometimes (not all the time, I know), it’s also nice to hear a good post-infertility, God-came-through story, which the Platts have. 5.) 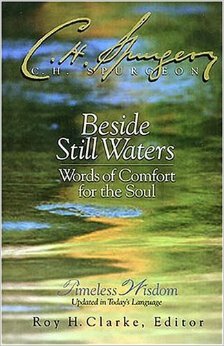 I also want to read Charles Spurgeon’s Beside Still Waters, which has great reviews. I heard CJ Mahaney read it daily to his daughter when she was in the hospital with childbirth complications. It sort of looks like you can get the pdf for free here, but so far I haven’t gotten it to work. Let me know if you do, because there isn’t a Kindle version for sale that I can find, unfortunately. 6.) I read that factoid about Mahaney in this little list of resources I randomly came across. It’s meant for pastors to prepare their congregations for suffering, but I breached the system and am bringing it straight to you, no middle man. It has a few more books you may want to look into. What are some places you’ve found truth-filled encouragement (big or small) recently? Perhaps a video clip, a sermon, a book, an article, a devotional or a song? Please add to my list! Out of nowhere this book popped into my head this evening and I knew it was perfect for this blog. I haven’t read it, but I have had two different sets of friends recommend it. One couple experienced just about the same story as the couple in this book — they found out at their 5-month ultrasound that their baby had a chromosomal issue that made him “incompatible with life” (cringe, I know — those are the doctors’ words, not mine). She carried full-term, against an abortion recommendation, and he passed away while she was in labor. Later they sent out an e-mail to all of their prayer supporters and mentioned how this book was really encouraging and helpful to them while preparing for that loss. It stood out to me because we are friends with another couple who has lost two children. One passed away in a car accident as a 9-month-old baby, and after having another healthy child she was pregnant a third time with a baby who passed away in her 8th month for unknown reasons. She delivered soon after. Later she also recommended this book to people in similar circumstances. So, you may want to read it if you are facing or have faced something similar, or even if you are just struggling with infertility in general but may find comfort or encouragement in her words regarding grief and loss (I was touched by a woman who spoke at my church’s infertility conference on the grief of infertility, as it is at least loss of a dream and a hope, if not more). 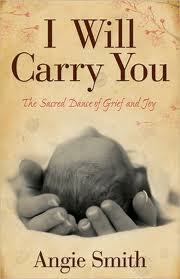 It’s called I Will Carry You: The Sacred Dance of Grief and Joy by Angie Smith. She is the wife of the lead singer of the band Selah. They produced the song below about the loss of their daughter. Below that, I am including a video of the couple sharing their story.